What is included with each Well? 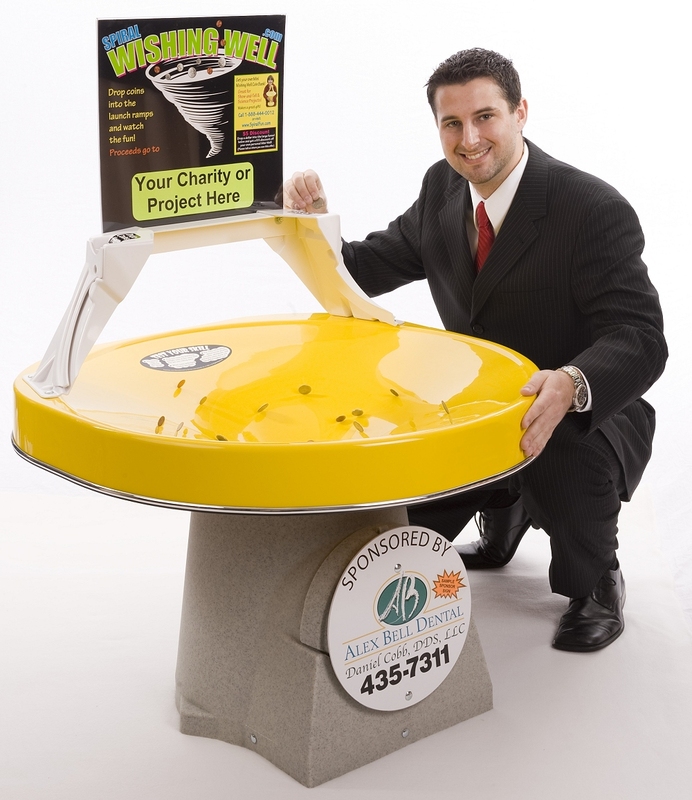 Each Two and Three Footer Well comes complete with everything you need to put it directly into service, including the funnel, base, coin launch ramps, a padlock and 2 keys, clear plastic sign frame, a 4-color generic sign poster on which you can affix the name of the project or charity, a 5-quart plastic bucket to make it easy to reach in and remove the coins, and simple illustrated assembly instructions All you need is a common 7/16" end-wrench (or an adjustable wrench or driver) and a few minutes. The round sponsorship sign shown in this picture is optional and an additional cost. 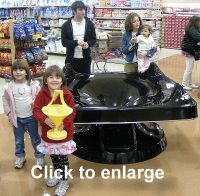 Seven Footers include the funnel and base. 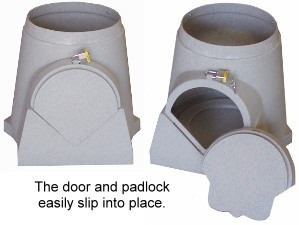 The base has a door with a cam-lock and 2 keys. 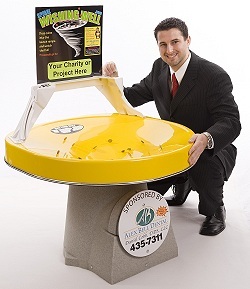 The funnel has 8 built-in coin launch ramps. All other items are optional for the Seven-Footer. They are discussed and listed here. The new* model ramps are white vacuum-formed ABS for a much more professional look and consistency than the previous rotationally-molded models. They are connected by a matching ABS bridge and welded together for maximum strength. 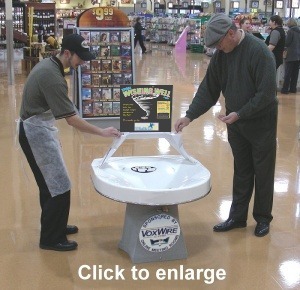 Each Well includes a clockwise and counter-clockwise ramp which launches coins in opposite directions. People love to watch the coins spin toward each other and sometimes crash as they descend the slope in tighter and tighter spirals. Each coin launch ramp has a wide coin-drop area that makes it easy for children to drop and launch coins at the perfect speed for a maximum spiral path. 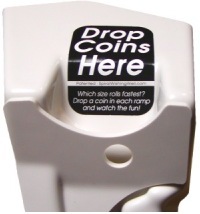 The "Drop Coins Here" sticker includes wording that encourages experimentation and increases income. The hole in the front of the drop plate is in case someone jams more than one coin into the slot. The hole makes it easy to release the coins. *See our patent page for more information on our proprietary designs. The new rotationally-molded bases are 20" (51cm) in diameter at the bottom for more stability than the previous 18" (45.7cm) version. They also have a "drop-in" door that is much easier to insert and lock than the previous round cog-lock system. The bases are granite-gray. They only weigh 12 pounds but are very sturdy. They are designed so you can move them. See Dimensions and Weights for details. You can make your own base as many of our customers do who place their Wells in permanent locations such as museums, zoos, libraries, etc. Click here to read about custom bases. 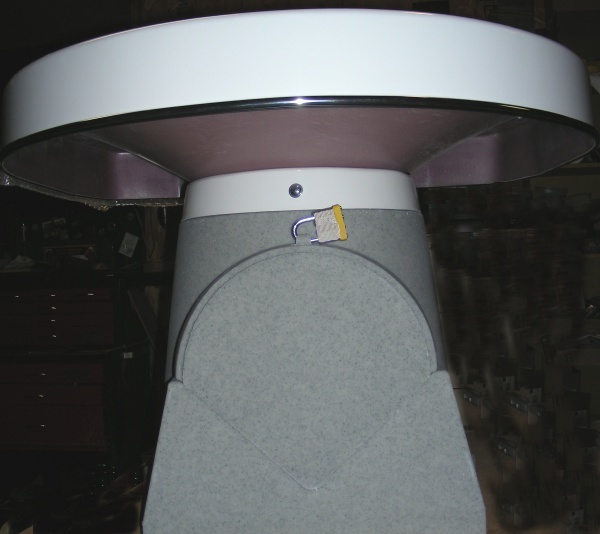 This picture shows our clear plastic sign frame which mounts to the back of the coin ramps. 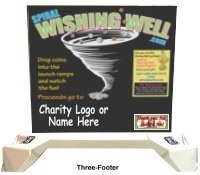 Inside the frame is a two-sided four-color sign with space on the bottom for you to place a charity logo or name. 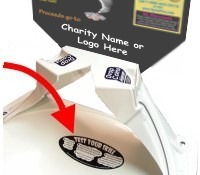 This generic sign is designed so you can get started raising money immediately. Of course, you can create your own signage to slip into the clear frame. Click here to see exact dimensions. Notice the "Vortx Mini-Well Offer" on the right side of the sign, discussed below. English Language: Our signs and stickers are in English. If you are international, please click here to read about language options. We include the "Vortx Mini-Well Offer" as part of the sign that encourages people to toss in DOLLARS rather than pennies. This can DRAMATICALLY increase the revenue. 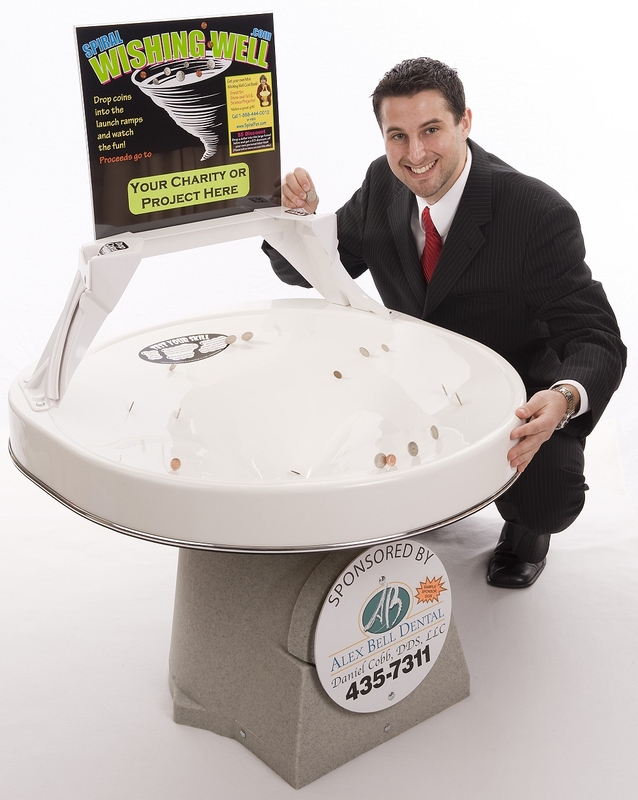 While Moms and Dads are watching their children have fun dropping in coins, they see this offer and quite often drop in a dollar and place an order with their cell phones while their children continue to roll coins. When they contact us, we never question whether or not they actually toss in a dollar. We know that most people drop in a lot more than that. We are happy to provide this incentive because it helps generate more revenue for the charity with absolutely no additional organization or hassle for the host location. Optionally, if you prefer, you can inventory the toys (at wholesale cost) and sell them to your customers. Or, if you are a charity, you can raise a lot of additional revenue if you "give the toys away FREE for a $25 or greater donation!" Click here to read more about this option. We affix a "Test Your Skill" laminated vinyl sticker to the funnel surface just under the coin ramps. This encourages experimentation and increases the coin revenue. English Language: As noted above, our signs and stickers are in English. If you are international, please click here to read about language options. Add over $1,000 per year to your coin-revenue with an annual-renewal sponsor, or just get a sponsor to pay for your Well so you don't have to. A popular option is to accept significant additional revenue by allowing a corporate sponsor to place their name, logo, or message on the Well. The going rate is $100 per month or $1,200 per year for the Two and Three-Footers, and a WHOLE lot more for the Seven Footer. It is a great way to get the cost of the Well covered immediately. Be sure to click on the above picture for a larger view. 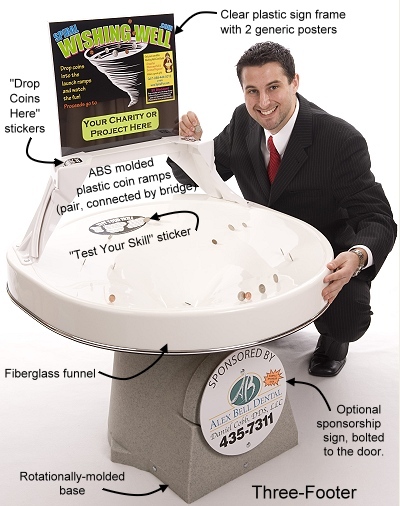 "There is no better advertising opportunity for a business than having its name on Spiral Wishing Wells located in the most valuable real estate in town...retail stores." See Sponsorships for more information about this popular option and how to get a sponsor. New materials and fiberglass technology have become available over the years which we have incorporated into the new design. We have also made some important performance improvements that are included in our new utility patent. The new models look more professional, have a smaller outside dimension with a larger actual funnel which spin the coins longer, offer greater visibility of the funnel surface, and are more durable. 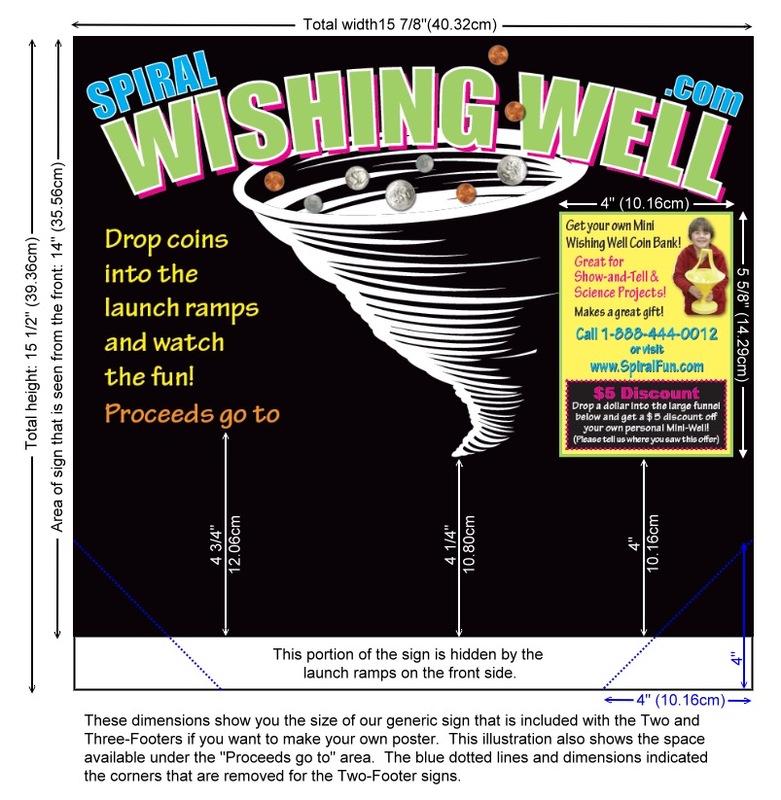 By moving the coin launch ramps OUTSIDE the funnel perimeter and toward the back, the new design provides a LARGER coin-rolling surface (more spirals) and greater unobstructed visibility than past models. With the older designs, the ramps were mounted INSIDE the funnel perimeter. Therefore, the coins had to be launched on a path that avoided the ramp on the other side which substantially reduced the effective rolling surface. Click here to see a pictorial review of past models, including our original Five-Footer and videos that illustrate the significant advantages of the new design. We have maximized the performance and minimized the floor-space foot print which is very important for retail stores and restaurant locations. Also, it does not take up any additional shipping space or cost since the ramp-mounting portions fit into the otherwise unused corners of the box. 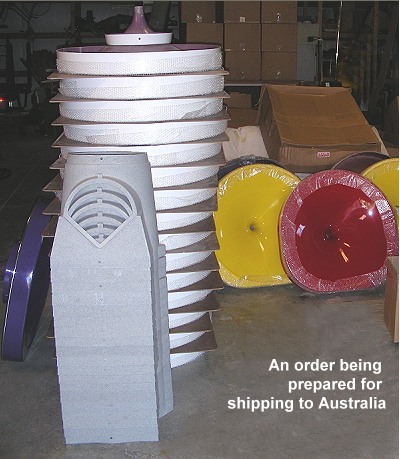 The new funnels are made of automotive quality fiberglass using Resin Transfer Molding (RTM). This method injects perfectly-blended resins, plastics, and fiber into a two-part mold which yields uniform thickness, superior strength, glassy-smooth finish, and a smooth underside to eliminate unwanted sharp fibers. Most fiberglass products use the "spray-up" method which is inconsistent and more "industrial". Our fiberglass system is also environmentally friendly. Seven Footers take the design concept of "mounting the ramps outside the funnel circle" to a whole new level with a 2-way ramp system in each "corner" for 8 total launch ramps. The entire funnel surface is unobstructed. Eight people can play at a time, so it attracts a lot more attention and the income is exponential! Click here to compare our new Wells with other models. If you would like to print pictures to show to your committee or a prospective location, we have provided these two options for you below. Of course, if you can show them the videos on the Home Page, that is even better, especially the video from Japan near the top of that page . of this picture in a separate browser window.